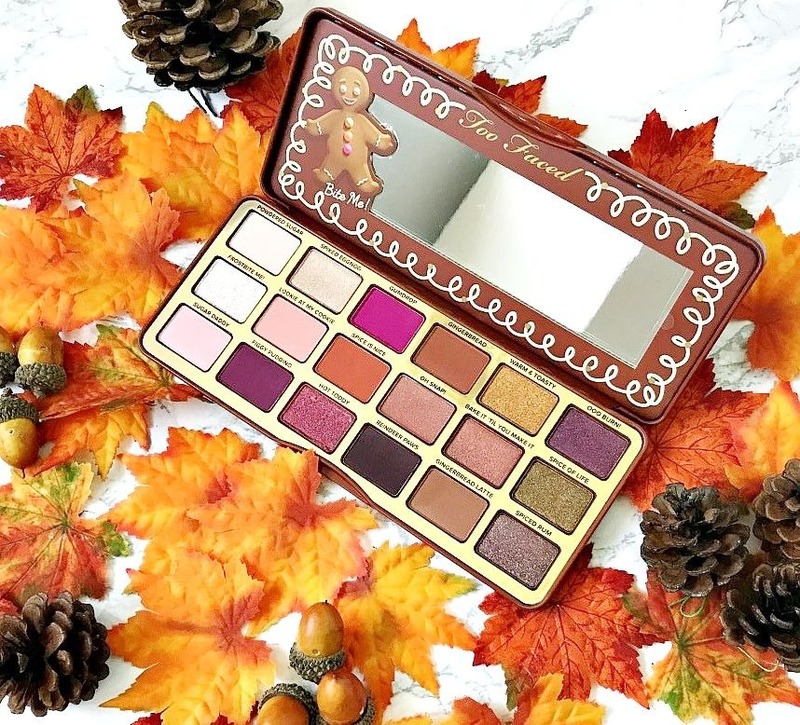 As with other Too Faced palettes, the packaging is a pretty sturdy metal case with a large mirror on the inside and, like the others, the shadows are scented but I must admit that it is fainter than the chocolate or peach palettes, which I am glad about because I am not a huge fan of the scent of gingerbread! 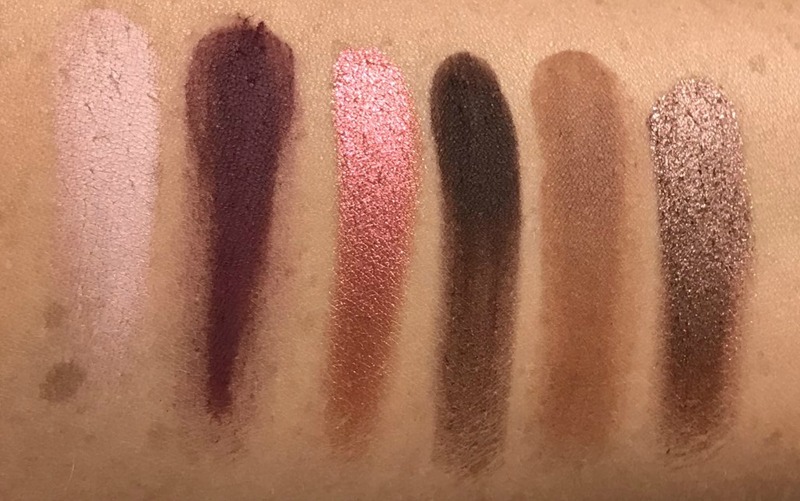 There are 18 shadows in the palette and unlike some of the others, they are all the same size, rather than having two larger shadows to use as highlighters, which I prefer. There are a mixture of mattes, shimmers and foils in the palette and a good mix of neutrals and pops of colour. What I really love about Too Faced shadows and the reason I have seven palettes from the brand, is the texture. They are so easy to work with because they are smooth and buttery soft, pigmented and they don't apply in a patchy way to all blend into one colour. This palette is no exception. 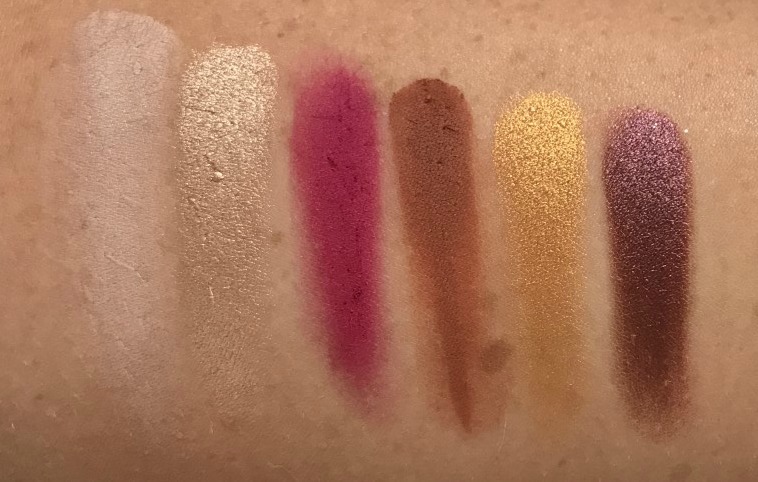 Swatches are completely unedited. From left to right: Powdered Sugar, Spiked Eggnog, Gumdrop, Gingerbread, Warm and Toasty, Ooo Burn. Powdered Sugar: Pale matte cream-beige - smooth in texture and applies evenly. Spiked Eggnog: Pale champagne with pinky gold tones and a metallic finish. Soft and smooth in texture. Gumdrop: Matte bright fuchsia pink. Feels slightly stiff to touch but applies evenly. Gingerbread: Matte warm brown with a hint of terracotta. Buttery soft in texture, applies smoothly and evenly. Warm and Toasty: Seriously pigmented coppery toned gold foiled shadow. Smooth, soft and easy to work with. Ooo Burn: Warm toned plum metallic shadow. Again, smooth, finely milled and buttery soft. 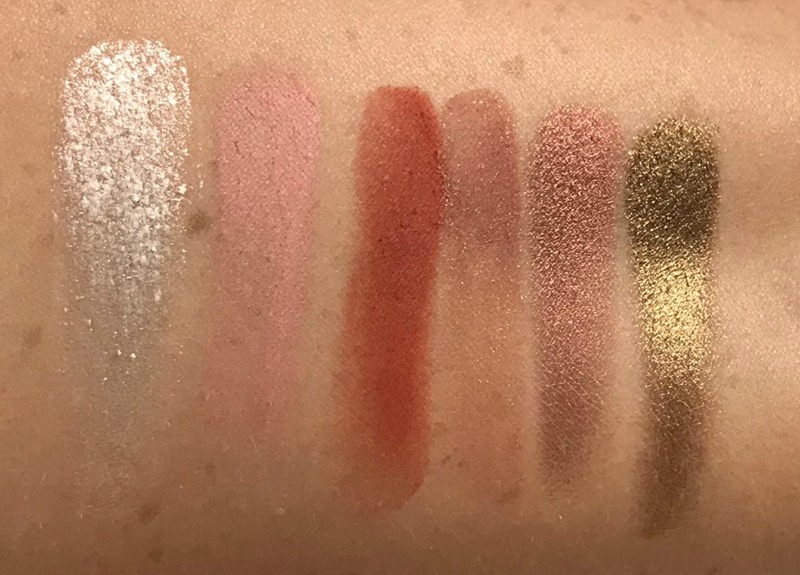 Swatches are completely unedited. From left to right: Frostbite Me, Lookie at my Cookie, Spice is Nice, Oh Snap, Bake It Til You Make It, Spice of Life. Frostbite Me: A warm toned frosted off white that feels chunky in the pan but applies smoothly on the lid. Lookie At My Cookie: A matte pale coral-pink matte. Slightly stiff in texture in the pan but applies evenly. Spice Is Nice: Matte orange shadow. Pigmented, smooth and soft. Oh Snap: Medium coral matte with some flecks of shimmer. Feels slightly stiff in the pan but applies evenly and blends well. Bake It Til You Make It: Deep rose toned bronze metallic. Pigmented, buttery soft and smooth - a dreamy shade. Spice Of Life: Olive toned bronze with a metallic finish. An utterly stunning shade that is buttery soft and pigmented. One of my absolute favourite shades! Sugar Daddy: Matte Barbie pink - I will never use this shade and I don't think it really belongs in this palette (or any palette for that matter!) but it's pigmented and smooth. Figgy Pudding: Medium berry matte that feels slightly stiff in the pan but applies very evenly to the lid and the pigmentation is perfect. Hot Toddy: Copper toned cranberry metallic that is seriously pigmented, smooth, soft and a dream to apply. Reindeer Paws: Deep plum toned brown matte. Moderately pigmented, which is perfect in a shadow this dark. Finely milled and applies evenly. Gingerbread Latte: Medium warm toned brown matte. Pigmented, smooth and applies very evenly. Spiced Rum: Medium-deep bronze shimmer. Intensely pigmented, creamy soft - applies equally well with both a flat brush or a finger. There are two shades that I probably won't get much wear out of but I love all of the others. Spice Of Life and Bake It Til You Make It are my favourite and most worn shades so far. For me, this palette is another winner from Too Faced! It is bound to sell out quickly so if you want to get your hands on it, act fast! Available from Debenhams for £39 but at the moment, it is reduced for £35.10. Or €47, currently reduced to €42.30 in Ireland. Also available from Cult Beauty. Have you got your eye on any Christmas releases? I'd love to hear!